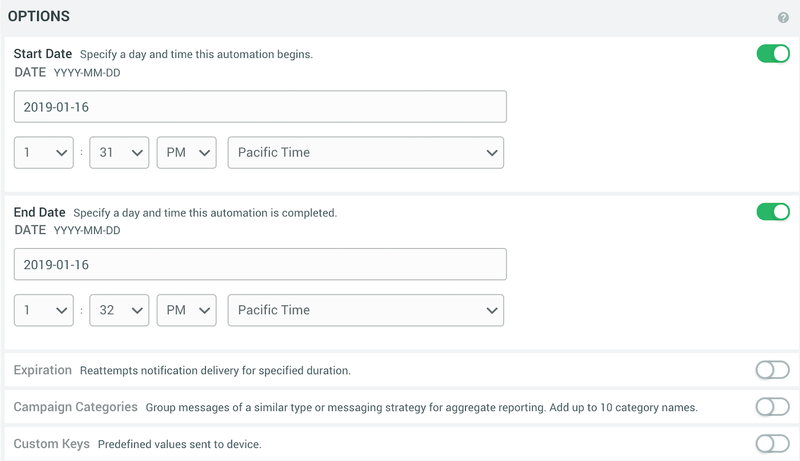 Managing automated messaging campaigns is even easier with our new start and end dates. Instead of manually starting and ending a campaign, set dates to start and end your campaign automatically. We also updated the Messages Overview for Automation with new statuses and action controls. Pending: The message start date and time has not yet occurred. Completed: The message end date and time has passed. Active and Paused statuses are unchanged. Play/Pause = Toggle message status. Changes the message status to Active or Paused. Trash can = Cancel the message. Changes the message status to inactive and deletes it from the message list. Related reporting data is also deleted. In the dashboard, set the start and end times in the Delivery step of the Automation workflow. One or both may be set. In the API, include activation_time and deactivation_time in the pipeline object.